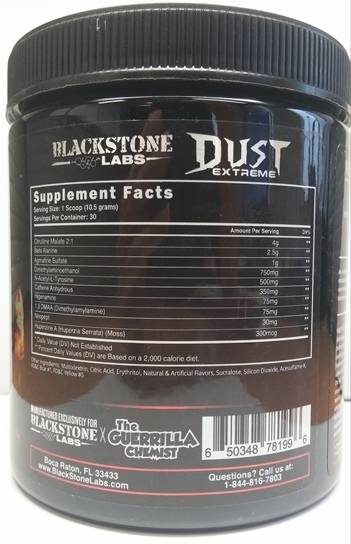 Health Canada is advising Canadians that it has seized the unauthorized health product “Dust Extreme” by Blackstone Labs, from Minotaure Nutrition, at 5333 Laurier Blvd., Unit 130, in Terrebonne, QC. 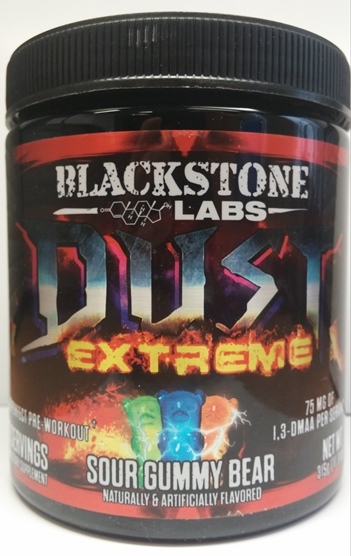 “Dust Extreme” is promoted as a pre-workout supplement and is labelled to contain the unauthorized drug 1,3 Dimethylamylamine (DMAA), which may pose serious risks to the health of Canadians. Read product labels to verify that health products have been authorized for sale by Health Canada. Authorized health products have an eight-digit Drug Identification Number (DIN), Natural Product Number (NPN) or Homeopathic Drug Number (DIN-HM). You can also check whether products have been authorized for sale by searching Health Canada’s Drug Product Database and Licensed Natural Health Product Database. 1,3-Dimethylamylamine (DMAA) is a drug that is not authorized for use in Canada. Side effects include high blood pressure, shortness of breath, chest pain, stroke and psychiatric effects. Health Canada seized the product from the retail location. Should additional retailers or distributors be identified, Health Canada will take appropriate action and inform Canadians as necessary.